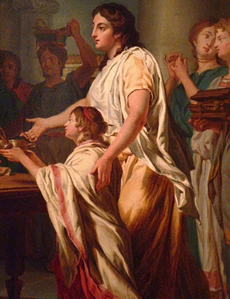 Women, status of The status of women in the Roman Empire was characterized by a long period of legal subjugation and family dependence that improved gradually from the time of the late Republic. Throughout the imperial era, women gained for themselves a greater degree of personal, financial, and social freedom. The subservient condition of women in early Roman society was maintained by the nearly all-encompassing right enjoyed by husbands and fathers within the paterfamilias. According to this dominating patriarchal system, women were excluded from all forms of public life and remained in a kind of legal servitude to their husbands, fathers or nearest male relative. In general terms, the Roman wife in the Republic existed in manu, meaning that she was subject to the authority (manus) wielded by her husband over her. Manus declined in practice toward the end of the Republic and women began to retain definite rights regarding property and status. However, women were still considered under the patria potestas of their fathers. The traditional separation of property ownership between husband and wife was altered considerably by the development of the dos (dowry), which made it possible for the wife to be returned the dowry at the end of a marriage. Outside of marriage, women endured many social, legal, and political handicaps, beginning from birth. A girl born to a Roman was greeted with mourning, and it was not uncommon for a baby girl to be left to die from exposure, much as the Romans commonly put to death any infants with deformities, or severe mental illness. Growing up, a young girl was entirely under the power of her father, remaining so until he was able to find her a suitable husband. In some cases, a patriarch might even sell daughters into slavery. As noted, marriage in manu meant a form of legal subjugation to husbands, and the wife held no legal control or claim over her children. For various reasons, the position of women improved gradually during the centuries of the empire. One cause was the established acceptance of the dowry system, which provided greater independence for women in marriage. Another was the tightening of the laws under Augustus concerning divorce and adultery that discouraged husbands from taking marriage vows too lightly. Finally , women, through determination and patience, created for themselves a better position in the Roman world. Life for lower-class women was quite different from that of women of the upper classes and nobility. It was marked by a certain stultification, with the days of the peasant women cast in virtual stone from birth to death, in much the same way as that of her male counterpart. Few details are known about the work and habits of lower-class women, but it is acknowledged that they were engaged in various professions, such as textile production. Evidence for the involvement of women in industries is found in the remains of Pompeii. We also know little about the daily lives of middle-class women, although their days were certainly spent in more comfort than those of the poorer women of Rome. The place of wealthy women in the empire was still handicapped by legal and social restrictions, including the inability to vote or participate openly in government, and by other traditional impediments in marriage and divorce. Nevertheless, women could exercise much independence and also political and cultural influence. Their position was assisted by the largely self-enclosed upper classes. The wealthy intermarried and knew each other, making it easier for women to play a role in political affairs by assisting husbands with their clients and the maintenance of the domus and villa. Young girls of the upper classes were also frequently given an education equal to boys’, and there are a number of examples of women becoming notable writers, poets, and artists. One of the best known was Sulpicia, wife of Calenus, who was praised by the poet Martial. Equally, Roman history is replete with women who came to wield great power and influence and who were of great importance in the administration of government. Among these remarkable women were Eudoxia, Galla Placidia, and Theodora, wife of the sixth-century emperor Justinian.